Being a child I always wanted to become an artist, but my parents pushed me into university and I became an architect… After about 15 years without drawing I struggled myself through tutorials, workshops with several watercolour artists, doing loads of work, struggling to find “my style”… It was full of stress, where it should have been fun and full of joy! I did also a lot of watercolor workshops and it all seemed so complicated and non-intuitive… There are funnier and easier ways to learn how to draw & paint. So I created this workshop especially destined to beginning sketchers who struggle with drawing and “start from scratch”. For that I also use Betty Edwards method “Drawing on the Right side of the Brain”. I think it’s an excellent method. I present some of the exercises in the book applied specifically to urban sketching. As it’s in spring, I plan to go sketching cherry blossoms in Brussels. The last Sunday we’ll go to Bruges. In november and december I organized 4 “Simply Draw It”-sessions, and now I add “paint it” to it, as I experienced everybody likes to give more attention to end the sketch in watercolour. So let’s “Simply Draw & Paint it” ! Because even if you do it only 5 minutes a day: by the end of the year you’ll have made gigantic improvement to your art! I developed some urbansketching exercises based on Betty Edward’s method to make drawing more accessible and to make progress in drawing more effective and joyfull and to take away the fear of making a “bad” drawing. 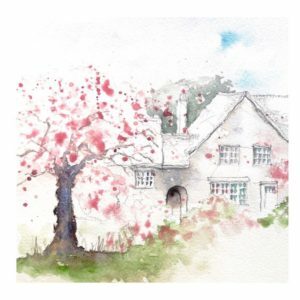 – April 21st and 28th we’ll be sketching cherry and magnolia blossoms in the famous social housing garden city “Le Logis Floréal” in Brussels. Your sketchbook and your favourite drawing tools, such as a graphite pencil HB, B or 2B, colour pencils, watercolors, pen or markers of your choice. And a folding stool to be comfortable. Personally I use ballpoint pen, 2B pencil, waterproof ink and watercolours. Ah oui je comprend que ce soit un peu trop peu une demie journée pour venir de Valence…Hmm la prochaine fois je prévoirai une journée complète…. Tu voudrais venir quelle date si c’était un jour complet? Peut-être que d’autres seraient intéressés? J’envisage de changer des dates une journée complète à Bruges pour la séance du 5 mai. Ca t’intéresserait ou est-ce trop loin pour toi? Hopefully you will have an online workshop sometime soon! I am too far away to attend, but love your painting and sketching! Hi Corinne, are you planning a workshop in July or August 2019?